This home is dressed to impress with its stone and stucco exterior and dramatic square-columned entry. The drama continues in the vaulted foyer with clerestory window and throughout the rest of this well-planned home. The great room with cathedral ceiling adjoins a breakfast area which opens onto a side porch. The kitchen features an angled counter with stovetop, pantry, and easy access to the formal dining room. A separate utility room has built-in cabinets and countertop with laundry sink. 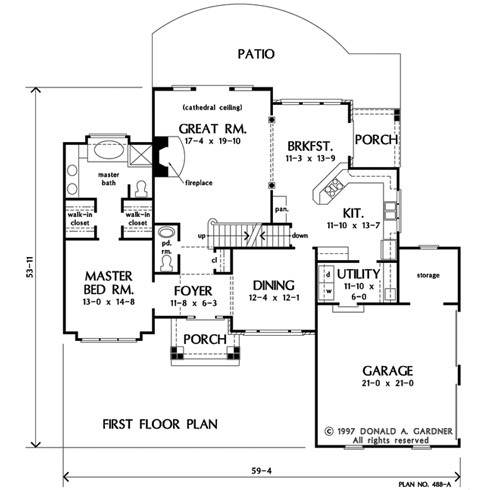 Double doors lead into the first floor master suite with box bay window, two walk-in closets, and lavish bath. 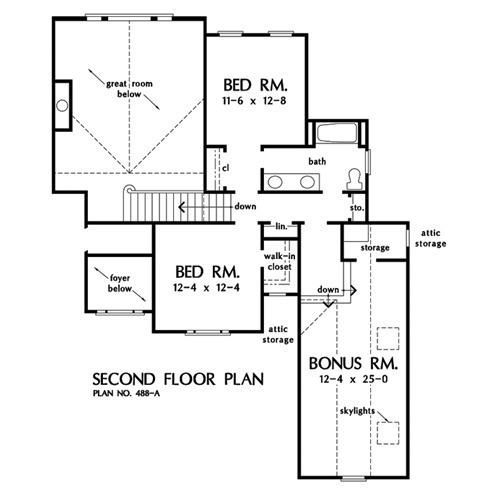 Two more bedrooms are located upstairs along with a full bath, linen closet, and skylit bonus room. 2nd Floor: 549 Sq. Ft.
1st Floor: 1572 Sq. 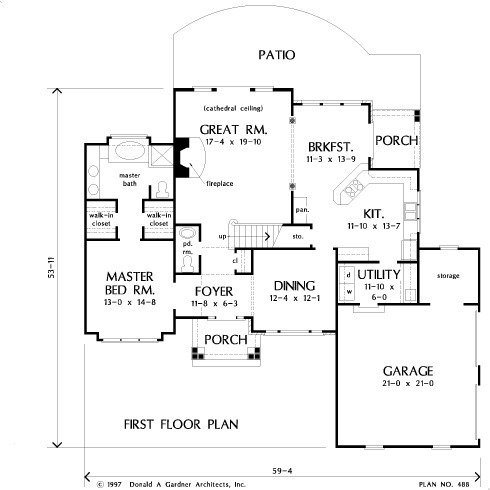 Ft.
House Dimensions: 59' 4" x 53' 11"
Foyer (Vaulted): 11' 8" x 6' 3" x 13' 10"
Dining Room : 12' 4" x 12' 1" x 9' 0"
Great Room (Cathedral): 17' 4" x 19' 10" x 18' 4"
Kitchen : 11' 10" x 13' 7" x 9' 0"
Breakfast Room : 11' 3" x 13' 9" x 9' 0"
Utility Room : 11' 10" x 6' 0" x 9' 0"
Bonus Room : 12' 4" x 25' 0" x 9' 3"
Garage Storage : 8' 9" x 8' 0" x 0' 0"
Master Bedroom : 13' 0" x 14' 8" x 9' 0"
Bedroom #2 : 12' 4" x 12' 4" x 8' 0"
Bedroom #3 : 11' 6" x 12' 8" x 8' 0"
Porch - Front : 10' 2" x 6' 1" x 0' 0"
Porch - Rear : 7' 1" x 8' 10" x 0' 0"
Deck / Patio : 36' 11" x 8' 0" x 0' 0"
Storage (Bonus) : 7' 4" x 4' 0" x 9' 3"
Storage (1st Fl.) (Sloped): 8' 10" x 3' 3" x 0' 0"
Storage (2nd Fl.) : 1' 8" x 3' 3" x 0' 0"